Another year older for my dear dad in this month of March. 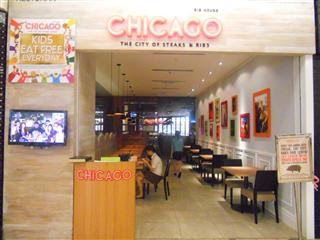 We decided to take our dad to have his birthday dinner at Chicago Rib House at One Utama. It is our first time there and it was just okayyy laaaa. We came on a wednesday night, so there was not much of a crowd, which was a good thing. After the long wait, finally the food arrived. We started with some nachos. I kinda took this photo after we swallow a few pieces, we were too hungry. haha! Next, we had the tortilla salad with grilled chicken. This is by far the best dish we had all night. We loved the texture and taste of the crispy tortilla. If you do decide to eat there next time, do order the tortilla salad. Then, we had the Aglio Olio spaghetti. It is not bad. They have generous amount of beef in the dish. We also tried their ribs. We came to a a rib house, ofcuz we had to try their ribs. They have a few different type of rib marinates that you can choose from. The ribs was so so. Not what i expected. Tony Romas Other places serve better ribs, so no more ribs if i come back here. We also tried their Hickory BBQ Bacon burger. Now that would have been awkward! Their burgers are surprisingly not bad. The patty is tender and juicy. Very rich piece of meat. Hahaa. Then, as we were eating, we notice that most tables ordered their burgers instead of their other food. We've been conned into eating their not so good other food! All in all, the food was just okay. I would recommend ordering the tortilla salad and the burger if you do decide to try eating there. I think my dad was kinda happy his children brought him a birthday dinner but at the same time sad cuz the food was not up to his standards. All of us will drink a jar of fresh orange juice every morning. It is our pick me up elixir! My dad also juices fresh vegetables, star fruits, watermelons and pineapple. Side joke: My dad kinda got high once on fermented pineapple juice! His tolerance is probably like a -ve. It was so hilarious! We use a special kind of juicer where there no need for any water. So 100% of the juice we drink is from the fruit/vege. Feel healthier with every sip. And yes, we use alot of fruits!!! People at the wholesale markets think our family open some fruits business. hahaha! Some of the juices we have in the fridge. And yes, we buy the jars in the dozens too. This is my dad doing is daily thang! But then...He only manage to do the 10 mins warm up! haha! He says: We must slow sink into it. Cannot over exert ourself or not we won't be able to enjoy it! For what i want to push myself so hard! Words from a man half a century old. However, even by just doing a short 10 mins workout every morning, my dad lost a few inches off his waist. He is constantly pulling up his pants! Yeah! Yes, i did promise a post on insanity. Many of you are probably wondering what it is all about. It is coming soon ya. My father has been the best father any girl could ever dream of having. No words can describe how grateful i am to have a father like you! This post is dedicated to my daddy. Hope you all were entertained!